Big in America. And Germany. A nice milestone for Netflix: Some 51% of American internet users say they used the site to watch movies or TV shows over the past 12 months, according to a survey conducted by RBC Capital Markets, representing an all-time high. 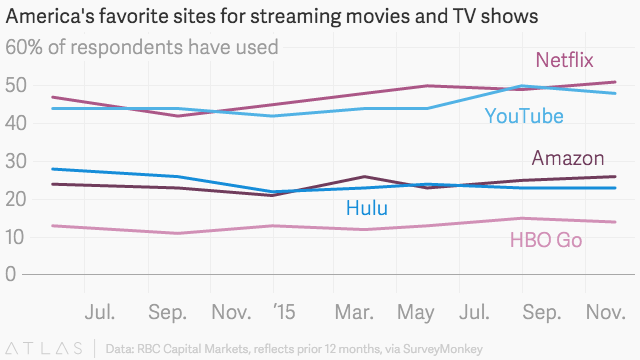 That puts Netflix on top of YouTube, the report from RBC analyst Mark Mahaney said, and well above Amazon, Hulu, and HBO Go. The survey results raise the question of what exactly people are watching on YouTube—or at least think they’re watching. The site, which is mostly free, is full of shorter, native content, rather than full movies and TV shows that Netflix subscribers get. In short, they have very different value propositions. Netflix’s original content has played a major role in its ascent as the top subscription-based streaming service, and that’s no different as the company expands internationally. Some 52% of survey respondents in France and 64% in Germany say they’ve already watched “House of Cards,” for example. Bigger picture: “We believe that Netflix has achieved a level of sustainable scale, growth, and profitability that isn’t currently reflected in its stock price,” Mahaney writes. Netflix shares have more than doubled this year to around $120; Mahaney’s price target is $140. Netflix finished September with 43 million US streaming subscribers and 26 million international subs.